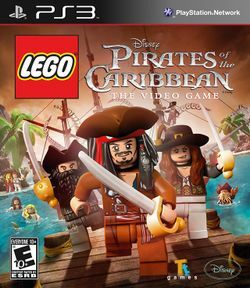 Lego Pirates of the Caribbean: The Video Game is a video game in the Lego video game franchise, developed by Traveller's Tales and published by Disney Interactive Studios and the first Lego game from a Disney movie. Released in May 2011 to coincide with the release of Pirates of the Caribbean: On Stranger Tides, the game is based on the Pirates of the Caribbean film series and its storyline covers all four films. The game is available on the Wii, Nintendo 3DS, Nintendo DS, Microsoft Windows, Xbox 360, PlayStation 3, Mac OS X and PlayStation Portable. This page was last edited on 4 April 2016, at 03:40.